I love a revenge film. The catharsis and emotional satisfaction that comes from seeing justice being played out against reprehensible people is pleasing at the most base level. I think most people recognize that films like these are fantasies and not guidebooks on how to act. I can't say on an intellectual level that vigilante action is something we should approve of, but for two hours in a movie theater it can be very therapeutic. 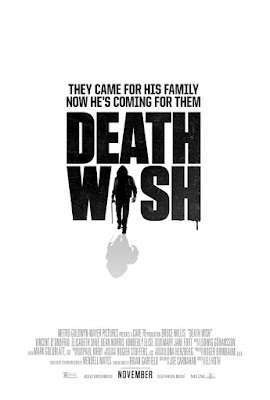 The original version of "Death Wish" from 1974 was one of the most controversial films of it's time. It was also commercially successful. So much so that the character returned in a series of decreasingly relevant and quality sequels. It was a film of the moment, when urban crime was overwhelming cities and turning them into dystopian outposts in the real world, not some fictional future. The script for this remake is written in a manner to play off of that paranoia, but do so in a modern context. Screenwriter Joe Carnahan has mixed the urban danger zone that Chicago has become with the suburban setting occupied by the protagonist and his family. This changes the way the character might be perceived and it allows the fear of random violence to be part of a more contemporary story. Another important change in the plot involves the lead now being a trauma surgeon rather than an architect. The avenging grim reaper now has a pipeline of bad guys coming through the emergency room, they provide him with a link to specific criminals. Charles Bronson's character was not seeking the specific criminals that destroyed his family, he had become a moral cudgel to thrash the unrepentant criminal element in a somewhat random manner. He actually begins to bait criminals into their actions to be able to take them out. 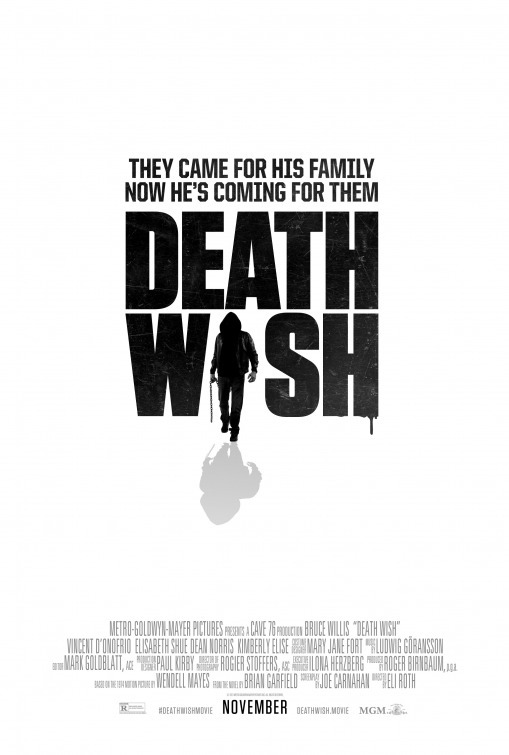 Bruce Willis does engage in a couple of random acts of vigilantism, but he mostly is pursuing leads that will bring him in contact with the particular gang that robbed and murdered at his house. The criminals in this film are an organized crew with a plan and an M.O. Bruce Willis has been making straight to streaming movies for the last five years and his enthusiasm as an actor is not very apparent in most of this movie. He still has enough charisma to make us watch in some sequences but he seems to be disengaged in some of the others. It is only when he starts killing people that he seems to come to life in the film. His sequences with the family or interacting with the police lack the edginess and sarcastic humor that mark his other roles. Vincent D'Onofrio is his brother, and it is not clear in any way how he is essential to the plot. There are a couple of scenes near the end where the brothers confront some emotional issues between them, and D'Onofrio seems like he is effortlessly creating a character while Willis is just standing there. However, director Eli Roth, has managed to inject some life into this film by making Dr. Paul Kersey, a relentless inquisitor and fledgling killer. In the original film, Bronson gets inspired by a visit to Arizona where a business contact encourages him to take up shooting. Dr. Kersey goes to Texas to bury his wife, and it is his father-in-law who inspires him indirectly by pulling to the side of the dirt road they are coming back from the graveside on, and unloading his rifle at a couple of poachers on his ranch. Coincidences become the staring point for his human hunting expedition when he recognizes a trauma patient as the kid who worked as a parking valet at his families favorite restaurant. Add a cell phone and a dropped firearm and he becomes a hooded FBI unto himself. Roth is known for the horror films that he has made and his touch with gore is clearly visible in many spots in this film. Kersey as a doctor, knows exactly how to torture someone to get information that he needs and Roth is happy to show us the process. There are brains splattered in a couple of scenes so the violence quotient is pretty high. Early in the film, there is a set up of a device that becomes pivotal in the climax of the story. Progressives are going to hate this film but the NRA might want to use it as a commercial for membership. The unfortunate real world events that have brought gun issues to the center of national attention recently, may find that the narrative they are creating about semi-automatic weapons, will be problematic to those who have an interest in owning them for a variety of reasons other than creating mayhem. The film lacks the grit and social relevance of the 70s original but tries to compensate with plot twists and higher levels of violence. The cop character in this movie is not as interesting as the Vincent Guardina cop in the original, but the perspective is effectively conveyed in a much more casual and subtle manner. If Bruce could manage to put just a little more effort into the non-action scenes, this could potentially be another franchise for a few years. Whether or not that happens, the revenge story is basic, brutal and as politically incorrect as you can imagine. All reasons for me to like the film at least.